It’s the afternoon of 24th February and I’m sat on the porch of my hut, which is overlooking the DMT’s (Dive Master Trainees) gallivanting around in the Davy Jones’ Locker resort pool, tanks and masks on, blowing air bubbles to the surface. Despite a growing envy, I sit here dreaming of life underwater and reflecting on the steps I took to becoming a certified Open Water Diver. 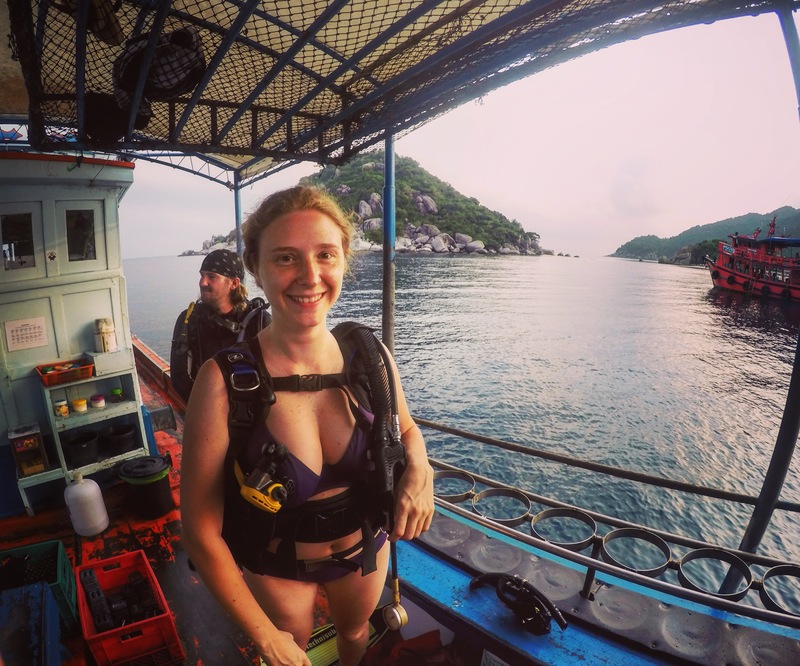 Although I knew I wanted to conquer my fear of the sea on this trip, I hadn’t realised that it would be in Thailand in the first week of a fifteen week tour of South East Asia, Sri Lanka and India. Having asked an STA Travel agent in Bangkok to recommend beach activities for us to do for the last 9 days before we depart for Cambodia, he recommended this with all his heart. After much deliberation, we decided to jump right in at the deep end and book there and then. Two days later we were boarding the air-conditioned overnight bus to Koh Tao, a trip that consisted of nine hours on a bus and another two on a ferry. The bus was much more comfortable than I had anticipated and after what felt like only a couple of hours it, we were pulling into the ferry port. Once we reached the port, we had to queue once to have our tickets reconfirmed and another time to board the ferry. So, what does a PADI Open Water Diving course consist of? I hear you ask. In short – you’ll be learning a whole range of underwater and surface skills, which will enable you to dive safely to a maximum depth of 18 meters. You’ll also be learning the safety standards in the classroom before hitting the pool for a few hours to practice. The theory is followed by an exam, after which you’ll jump on a boat to sea and commence your dives. To head underwater we were given a pair of flippers, BCD (Buoyancy Control Device), regulator, scuba tank, mask, weight belt, snorkel and a wetsuit. I chose not to wear a wetsuit though because I feel restricted by them and the water in Thailand is more than warm enough to swim just in a bikini. Having not enjoyed putting my head under the surface of water for years, I was nervous. But the positivity that shone from both of instructors (Rich and Nik, I’m talking to you!) helped immensely and before I knew it I was under the water in the pool breathing through my regulator slowly and steadily. Before we were allowed to descend to the bottom of the ocean, we were tasked with a 50-question exam. Having struggled with the RDP (Recreational Dive Planner), which helps divers who are not using a dive computer to plan their dives according to the depth and time, I spent the night before the exam panicking and wondering whether I would make the required 75% pass mark. Typically I scored 92% on the exam the following day and after a quick sigh of relief made my way to the boat with the rest of the group. During the course we learned two entries, the first was the Giant Leap, which is literally a giant step into the water and the second Dead Mexican, the scarier of the two, which sees you fall into the water from the side of the boat onto your back. I had to giggle at myself as I attempted the Dead Mexican – legs like jelly, squirming and whimpering quietly into my mask. The fuss was all about nothing and it quickly became my entry of choice. During training, we ascended to a maximum depth of 16.1meters, our longest dive time 45 minutes. At the end of our final dive, yelps and whoops emerged from each member of the group as we inflated our BCD for the last time and swam into the boat. We had done it! How would I describe scuba diving? I’ll have a go, although I’m not sure my words will do it justice. Every dive site that we visited was full of boats bobbing around on the surface. Oh no, I thought. I bet it will be too crowded down there with other divers. I was wrong. The difference is that you have no idea that any boats are above you and absolutely no idea what could be a few meters away from you. Out of the water you can see far and wide; under the water you have a few meters to see what is in either direction. You’re in a different world; not alone, but more alone than when you are on the surface. It’s a feeling I can only describe like this – and it’s a feeling that I loved. On my first ascent, looking towards what looked like a bubbly glass surface, my mind tricked me into thinking that we were about to burst out of a TV screen. It not just the incredible marine life that we saw when we were down there that makes me want to go back, it’s the fact that scuba diving is the most other worldly and coolest experience that I have ever had. Below are the dives and skills that we learned over the four-day course. I thank you Davy Jones’ Locker for teaching me skills that I’ll use for as long as I can. Now, let’s have a crack at the advanced course. At the end of our course, we were provided with a logbook to keep, which will keep a record of all of the dives that I ever do. I have totally fallen in love with diving and can see myself travelling around the world in search of the best dive spots. Having always thought I prefer snow holidays to beach holidays, I think I may have found my summer answer to skiing – and I can’t wait to see where it takes me. Previous PostTasty tapas and beautiful beer!